This section contains a large variety of spiritual answers covering topics that are relevant to seekers of all ages and backgrounds. 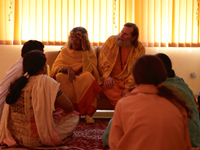 You will find answers about relationships, living in the world, the guru-disciple relationship, as well as answers regarding specific practices, scriptures, mantras, and deities. Gangotri has been a perfect place for us to perform sadhana. The Ganga flows by constantly singing with us as we chant while the while the Himalayas stand strong in the background demonstrating the perfect stillness of how to sit in an asana. The Navagraha Puja which is included in the Cosmic Puja is a powerful way to propitiate the planetary influences in our lives….